Inspired by Doug Trattner’s The Best Things We Ate All Year in the Cleveland Scene, I decided to look back on the best things I remember eating this year. I had a lot of memorable meals this year. It was the year I had a Seti’s Polish Boy, ate at Slyman’s for the first time, and discovered the deliciousness of Eat at Joe’s in South Euclid. It was the year my friends and I did a dim sum crawl that spanned two weekends because our eyes are bigger than our stomachs. I became addicted to the flavor of blood orange and developed a serious jones for Tommy’s banana milkshakes. It was hard whittling all the deliciousness of 2015 down to these fifteen choices, but three of them are not in Cleveland (so I consider them runner-ups). These bites are the bites I will remember for quite some time. Everyone raves about Fire Food and Drink‘s lemon souffle pancakes (and they are divine), but I was blown away by the tandoor smoked pastrami hash. 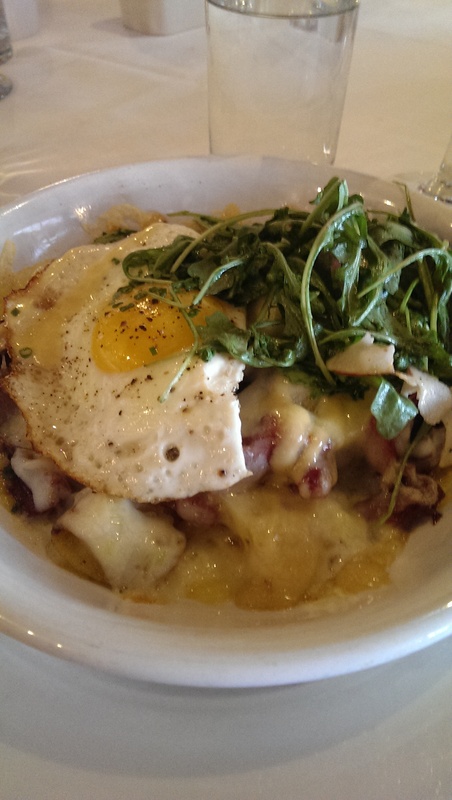 It features Yukon potatoes, Emmenthal cheese, honey dijon aioli, fennel, apple, arugula and a local fried egg and is out of this world. I love how the Emmenthal cheese and honey dijon aioli work together and meld with the potato and egg. Each bite was a little bit of heaven. And oh that honey dijon aioli!!! 111 Bistro in Medina has been consistently serving up delicious meals since they opened, and my friend Tom is one of the restaurant’s biggest fans. He arranged a birthday dinner there early this past year that was delicious, but the dessert was the absolute stand-out. Each dessert was a good-sized portion and delicious in its own right, but I was absolutely thrilled with the black pepper ice cream and the salted caramel cake. That salted caramel cake was so moist and luscious, and I never thought I would like – let alone be craving – black pepper ice cream of all things. It was a revelation. 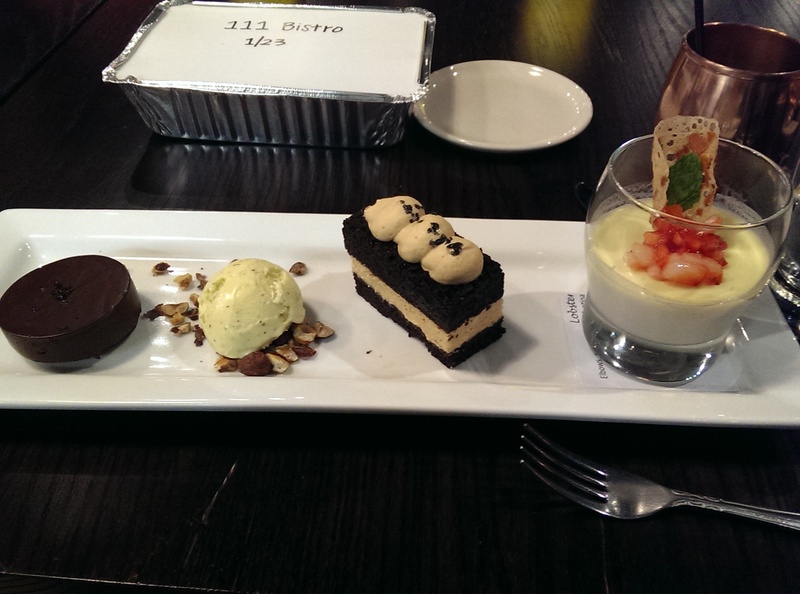 The flourless chocolate cake on the left and the panna cotta on the right weren’t too shabby either! I was very glad I had had my leftovers boxed up so I had room for dessert! It’s a nice touch to add the date on the box for the diner. Dinner in the Dark is always a dining adventure, but I still dream about this crêpinette by Tim Bando of Grove Hill in Chagrin Falls. This was my very first Dinner in the Dark, and I have to say I have not missed one since. This DITD was special because it united the powerhouse team that worked together at Moxie when it opened in 1997. With acclaimed chefs such as Doug Katz, Tim Bando, Jonathan Bennett, Eric Williams, Karen Small and Heidi Robb cooking for us, I knew it was a dinner not to be missed, and I was right. Each course was a delight, but I am still salivating over the lamb and foie gras crêpinette with polenta and a lamb demi-glace. 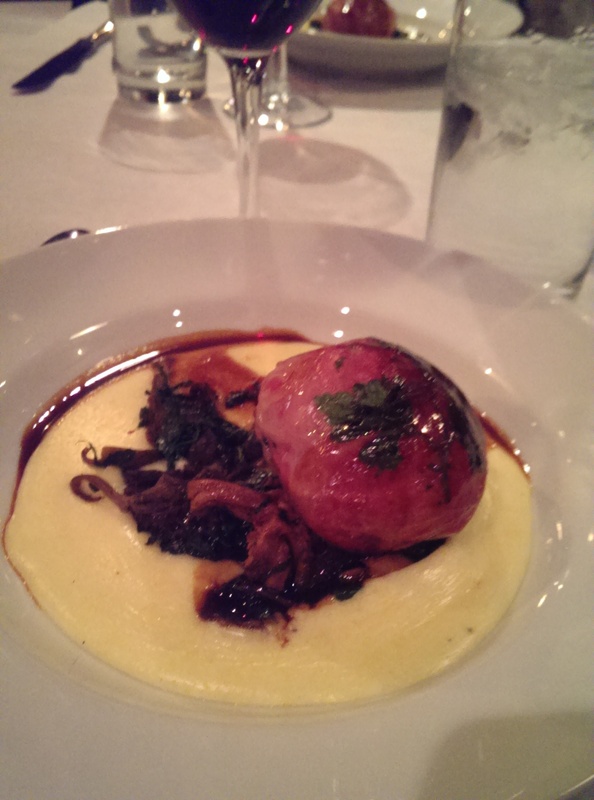 The lamb and foie gras “meatball” was so flavorful and unique, and the polenta and demi-glace just complemented it really well. It might just have been my favorite thing I ate all year! Graffiti: A Social Kitchen and its sister restaurant Cork & Cleaver are known for innovative, playful takes on well-known dishes. One of my favorite meals was a Cork & Cleaver pop-up at Toast while the Toast owners were on their honeymoon. It was a Hillbilly Picnic and featured some really awesome plays on “white trash” food that featured spam and french onion dip. Some of the dishes they debuted there have popped up on the Graffiti menu, so I knew I was going to enjoy Graffiti when it opened. We tried quite a few of the appetizers, such as the french onion egg roll featuring caramelized onions, Gruyere cheese and French onion jus and Hillbilly Pate, which is bologna pate served with sweet pickle relish, goat cheese whiz and white bread crostini (and is apparently no longer on the menu – bummer), but I was extremely pleased with their deconstructed Monte Cristo (thanks Yelp!). 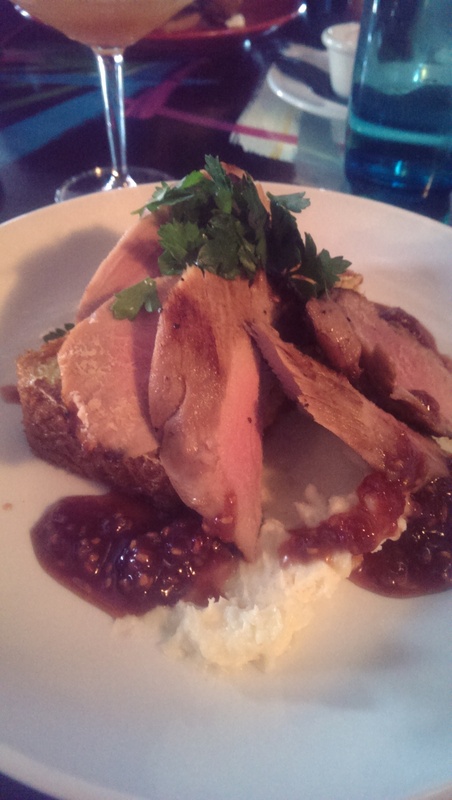 It features super-tender maple brined pork tenderloin, luscious French toast, mornay crema, and raspberry mostarda. A little bit of tenderloin and French toast dragged through the crema and mostarda made each bite the perfect bite. I had heard many good things about Map of Thailand from enthusiastic friends and finally made it there this year. 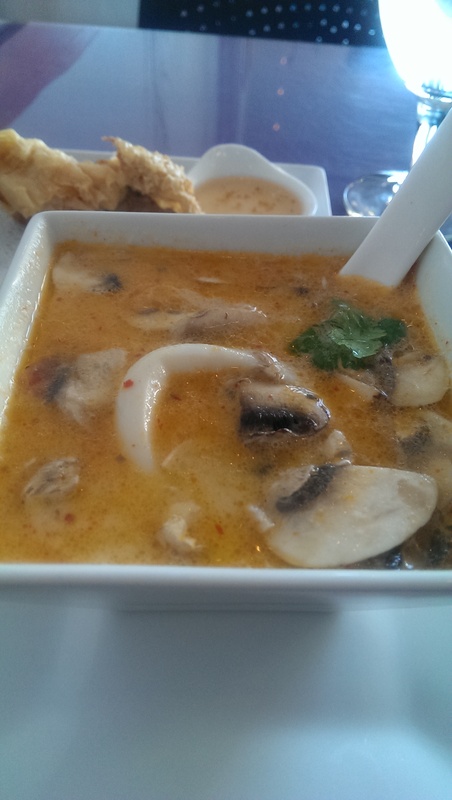 And then proceeded to keep going back repeatedly because of their amazing seafood coconut soup. 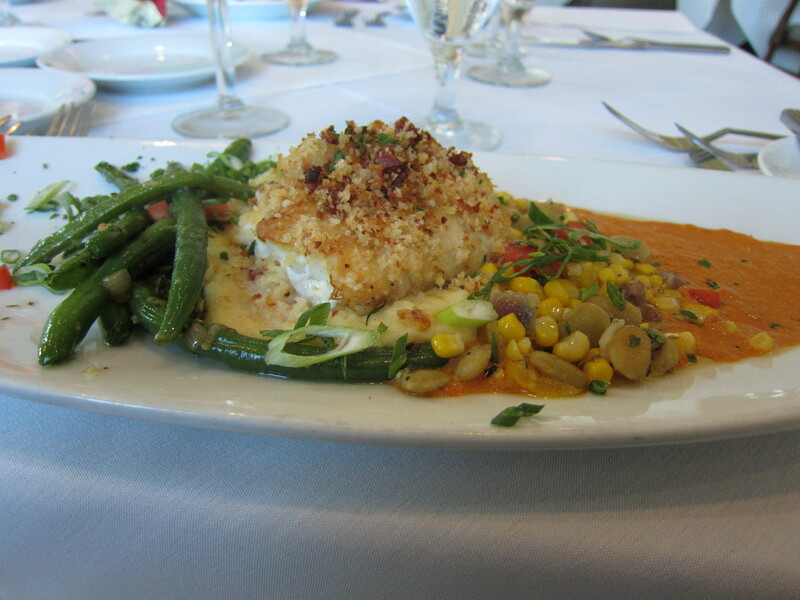 It isn’t a large portion, but it is a great way to start a delicious meal. The soup is billed as “Assorted seafood in coconut cream base soup, seasoned with spices, mushroom, lemon grass, galanga, cilantro and kaffir lime leaf.” The flavor is quite addictive. The calamari rings and whole shrimp are a little awkward to eat with the soup spoon, but I have gotten fairly adept at using my knife to cut them into bite-sized pieces before slurping it down. It is good to the very last drop, which I usually pour out from the bowl into the spoon. Walter Hyde and Scott Slagle of Fat Casual BBQ are known for their smoked prime rib (among other things). 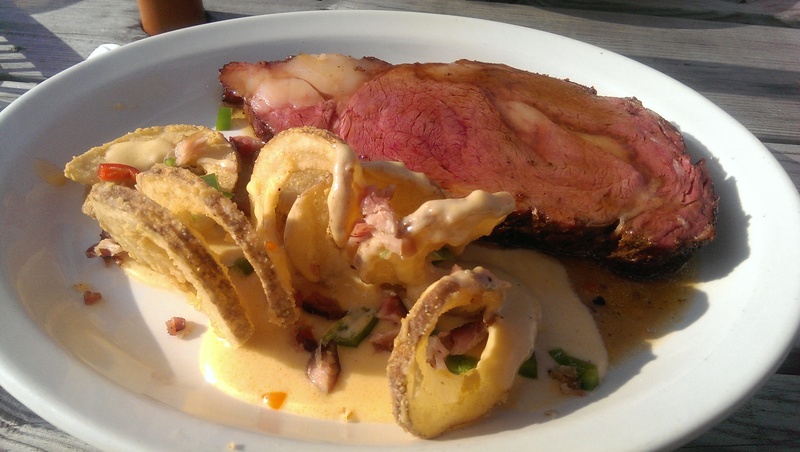 They were cooking at Sterle’s Country House this summer (in the Szemerszky beer garden), and I quickly became a fan of one of their latest innovative dishes – Polka Fries, which were spiral sliced potatoes topped with a beer cheese sauce and diced jalapeno. The prime rib and polka fries were definitely in my top meals this year. But the bite that I will remember was served at a special meal organized for a friend who was having surgery, billed as Bob’s Last Meal. 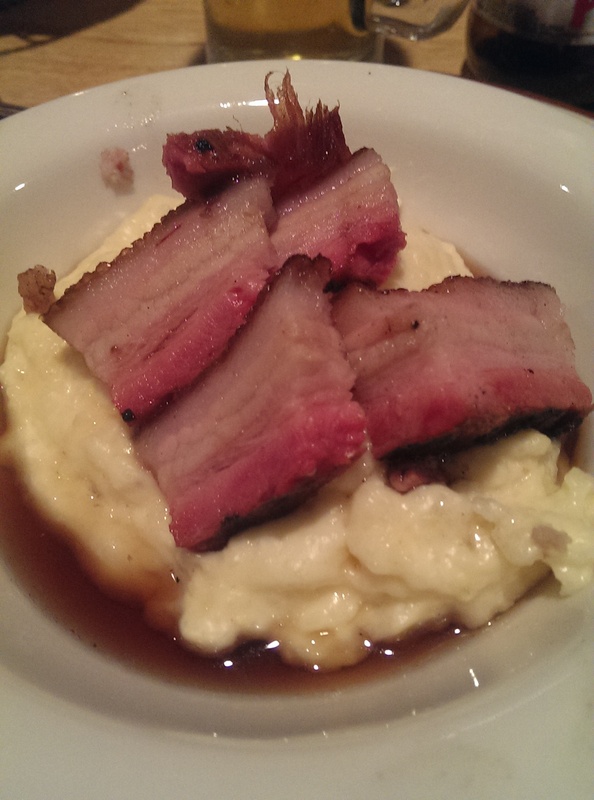 They made these smoked pork belly lardons over cheesy grits and a maple sauce that were simply to die for. They gladly brought out a second serving for me when I begged for one. It was incredible. Sterle’s also deserves a mention for their chicken schnitzel and waffle that they serve during their brunch. The chicken schnitzel is moist and not too heavily breaded, and it sits atop a crisp yet tender waffle. The whole thing is then topped with “Slovenian gravy,” spicy maple, and arugula. Brunch is served on Sundays from 11-2. 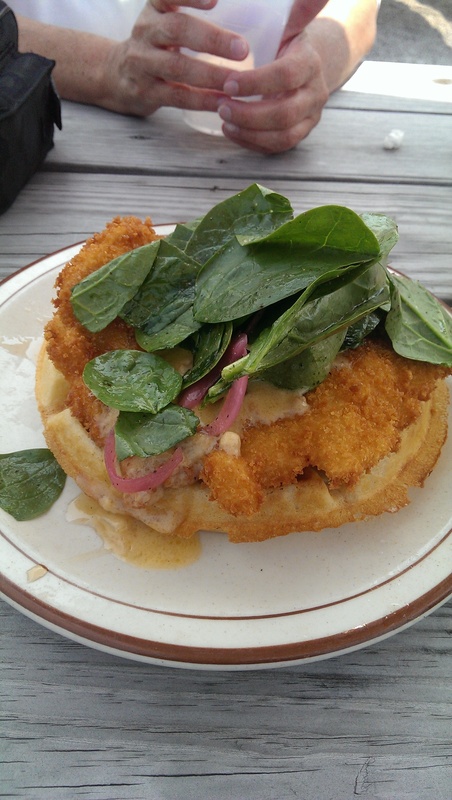 There are a lot of good choices on the menu, but the schnitzel and waffle is exceptional. Doug Katz reopened the Katz Club Diner this year and started doing pop-up dinners there instead of daily service. 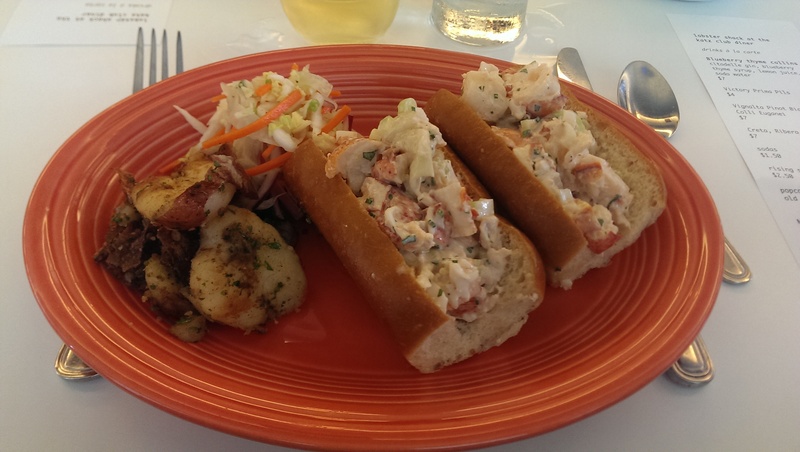 I have attended several dinners, but I was just wowed by his lobster rolls. The attention to detail showed from the buttery and soft roll to the perfectly dressed lobster salad. I could have eaten several more and been a very happy (but full) camper. Black Box Fix opened this year in Cleveland Heights in the space formerly known as Sweetie Fry, and I knew I needed to check it out. I will be posting a more comprehensive review soon, but I have to say that the OMG Philly replaced the now-defunct Now We’re Cooking’s Cajun Chicken Philly in my heart (sorry, Walter). Chef Eric Rogers created the OMG Philly, which features grilled chicken with sauteed mushrooms, onion, peppers and melted Swiss, topped with grilled jumbo shrimp, and drizzled with Yum Yum sauce. 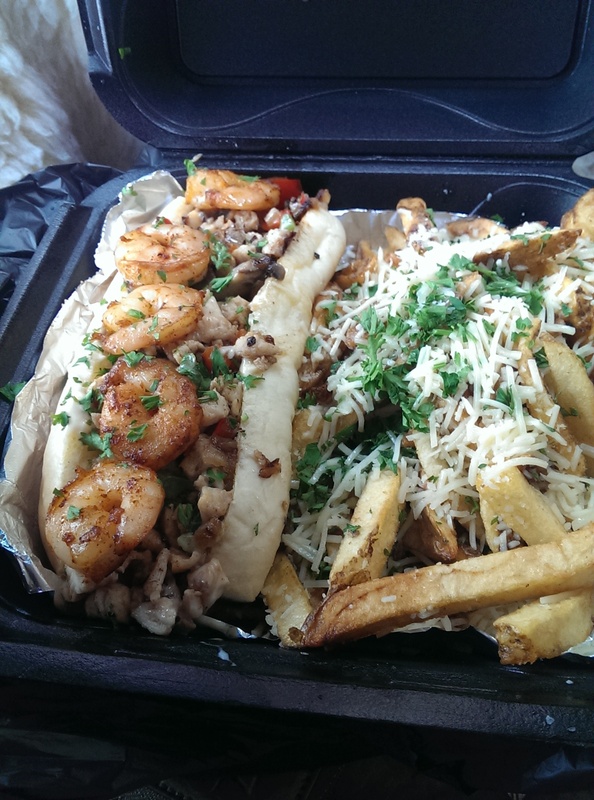 It’s kind of a mix between a Cajun chicken philly sandwich and a hibachi shrimp dish, and it is divine! Since I have been on an Asian food kick this year I knew I had to check out the latest Taiwanese restaurant, Phusion Cafe. 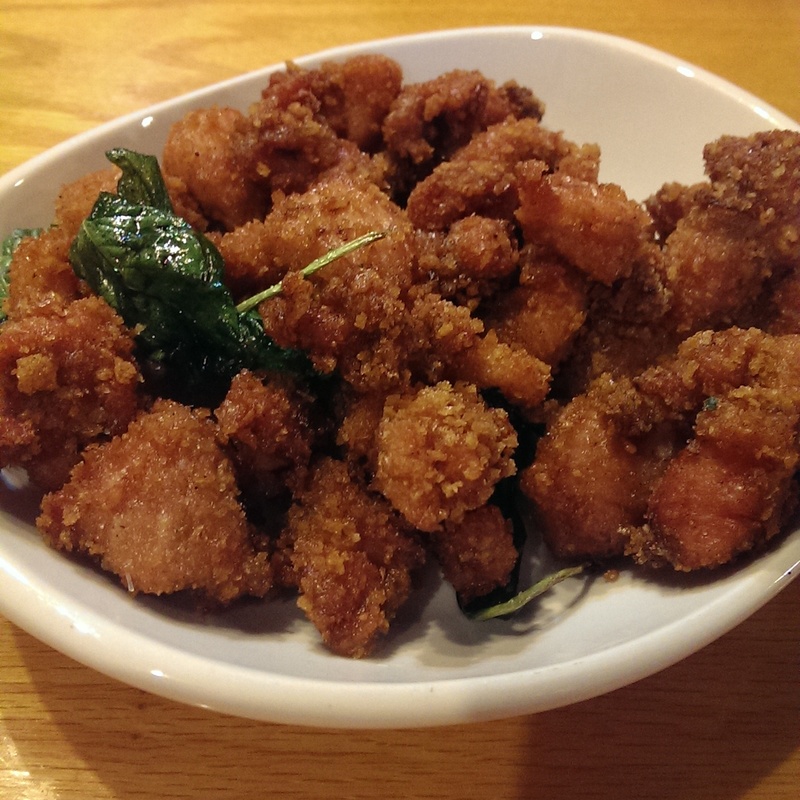 I organized several dinners there and had some delicious food, but the dish that absolutely astonished us and had us constantly reaching for more was their crispy chicken with fried basil. It was perfectly fried and extremely flavorful. My friend Nancy described it as “Chicken-Basil Crack.” I’m not sure if it is on their regular menu, but if you see it as a special do yourself a favor and order it. It was extremely addictive and makes a great appetizer. I love Fragapane’s Bakery for their subs and potato salad, but I was pleased to learn about Ferrara’s Imported Foods on Mayfield Road from a friend this year. 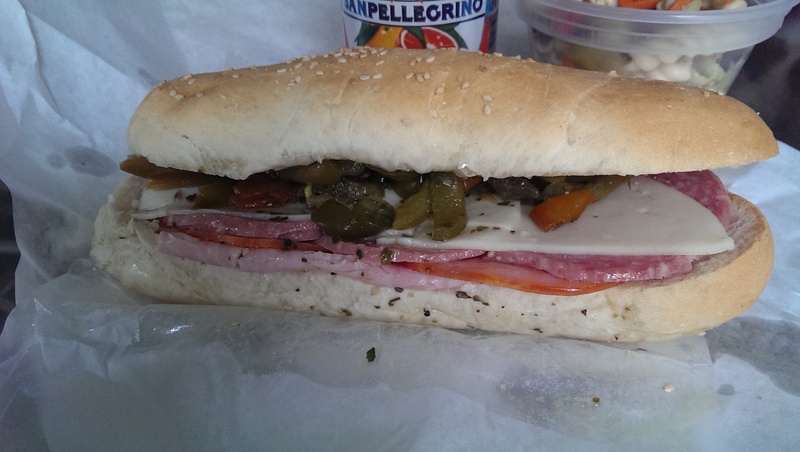 Their Italian sub with sweet peppers is a delight and is one of my favorite bites of 2015. It features homemade bread, Italian cold cuts and provolone cheese. And your choice of sweet or hot peppers. I am still a bit of a wimp when it comes to spicy (although Szechuan Gourmet and several Indian restaurants have me appreciating some heat in my food now), so I went with the sweet peppers. The cold cuts and cheese are sliced behind the counter and couldn’t be any fresher. The combination of the meat, cheese and peppers and soft homemade bread is mouth-watering. One of the best desserts I have ever eaten (let alone this year) was at the Dinner in the Dark at Deagan’s. It was a divine Warm Rocky Road Torte – molten chocolate cake in a torte shell, housemade marshmallows, honey bourbon ice cream, and bourbon and pecan Crème Anglaise by Emma Scheer from Humble Wine Bar. Unfortunately the preceding courses had all been rather filling, so I was unable to finish it and savor every bite. But I wanted to lick the plate! Everyone left the dinner raving about the dessert, and we are still talking about it months later! My camera battery died, so I am going to use my friend Edsel’s photo from his Flickr account. It’s a beauty. 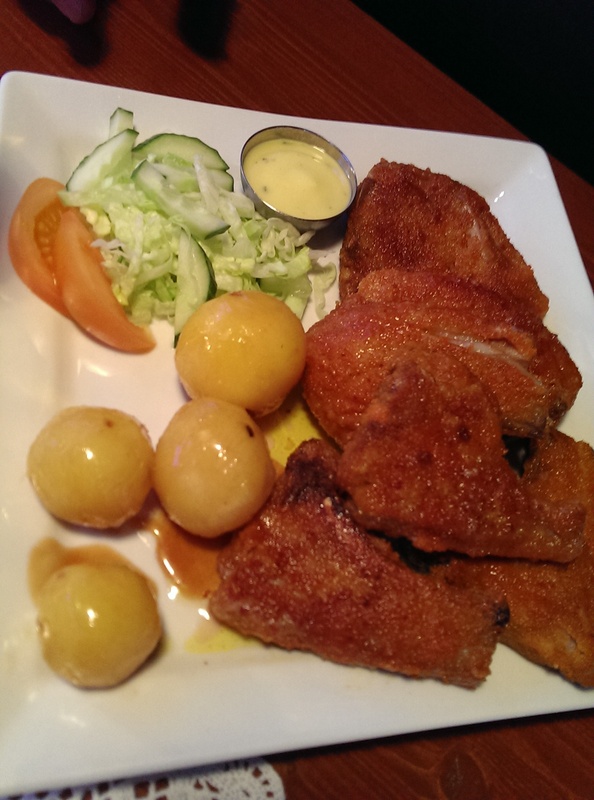 I did some traveling this year as well and was exposed to some very interesting cuisine in Iceland. In addition to mashed fish on rye bread, meat soup featuring local lamb and vegetables, fish kebabs, dehydrated fish jerky, and fermented shark fin (pro tip: do not try it! ), my most memorable meal was in a tiny little restaurant on the southwestern coast. My travel companion and I shared a lamb and a fish dish, and we were absolutely blown away by the butter and brown sugar potatoes that accompanied the pan-fried lamb cutlets. Very different — simple, yet delicious. 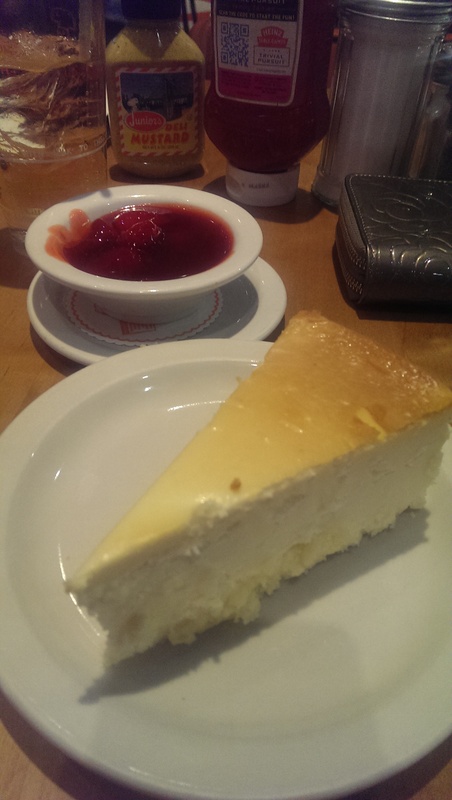 A trip to New York City for my birthday was not complete without a cup of matzoh ball soup and a slice of New York cheesecake from Junior’s. Junior’s is an institution, and when I posted the photo of the cheesecake several people just knew that’s where I was. I didn’t even need the strawberry topping I ordered on the side. The cheesecake was sufficiently luscious all on its own. Plus, I got the added bonus of watching a girl eat wings with a fork and knife. New York never disappoints! I had never heard of wreckfish before, but while staying on Seabrooke Island near Charleston, SC with my family to celebrate my parents’ 50th wedding anniversary the dish at the Palmetto Room on Seabrooke Island intrigued me. I’m not a fan of succotash because I detest lima beans, but this succotash was made with butter beans and was probably my favorite part of the meal. Definitely a memorable 50th wedding anniversary dinner for the food and the company. I’m also going to toss one in that I cooked, because I can. 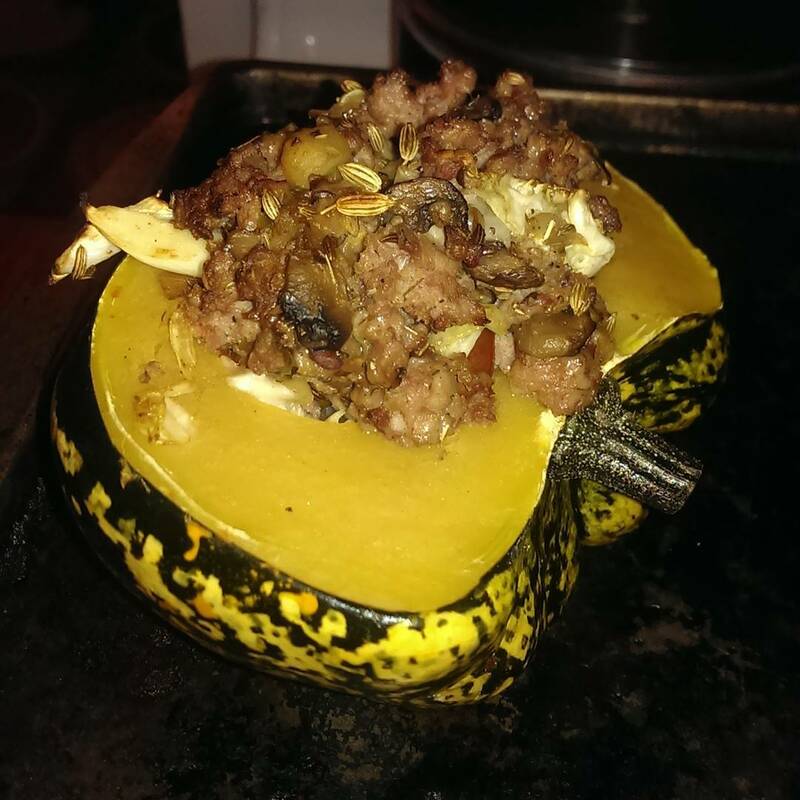 I learned to love squash this year, thanks to this recipe for stuffed acorn squash. I riffed on the recipe and used green onion bratwursts from Fresh Fork Market, chopped up some apple, sauteed some mushrooms, mixed in some mozzarella, and added some fennel, caraway and red wine vinegar for some flavor. I think I left out the spinach here because I didn’t have any. It was not just delicious – it was also a thing of beauty. I’ve made it several times since – most recently adding some leftover stuffing after Thanksgiving into the mix. It has never disappointed. I wonder what will wow me in 2016. I can’t wait. What were your favorite bites of 2015?